BOSTON, Ind. - It is ghostly quiet. The only sound is the slapping of a vinyl shingle against the side of one of the small, charmless houses on Salem Street. There are no sirens or street closings here, no sign at all of Super Bowl XLVI, which takes place Sunday in Indianapolis, 80 miles of pitted highway west of the grain elevators and gun shops that dot this part of the Hoosier State. Still, the proud few who live in this tiny, rust-belt railroad town are Bostonians, and for them the excitement of watching the Patriots play in another Super Bowl must be palpable, right? There’s no Kenmore Square to storm, but what craziness might ensue here if the powerhouse NFL franchise of their sister city win a fourth Lombardi Trophy? But finding football fans in Boston is not easy. You cannot just order a frosty beverage at the bar or stop by the filling station, coffee shop, or school. Forget about a bank, library, hotel, or restaurant. Boston, Ind. - population 177, give or take a few folks - does not have any of that. There is a Post Office, three churches (including the Boston Old Time Holiness Church), and one blinking street light. “Come on in,’’ says Nancy Sanford, who owns Cruise Adventure & Travel, a travel agency that is one of just a few businesses in Boston. Video: Looking for Pats fans in Boston, Ind. Sanford and her husband, Don, an accountant, have lived here for 40 years. They say the town’s gone downhill since the school closed several years ago. But they are content and could not conceive of living anywhere else. They visited the other Boston once on vacation, but they feel no kinship with it. Asked about the Super Bowl, Don Sanford’s eyes narrow. About the Super Bowl, Haynes admitted he has not given it much thought, but he knows one thing: He is hoping the Patriots lose. “I know the Brady name as the quarterback of the team, and he beat the Colts, so that would be the only animosity I hold against them,’’ he says. Surely, there is a Patriots fan among our brothers and sisters in Boston, Ind. Maybe down the street at Central Furniture and Carpeting, the oldest business in town. For 40 of its 55 years, the store has been run by Wayne and Tammy Hoit, who live in nearby Richmond. 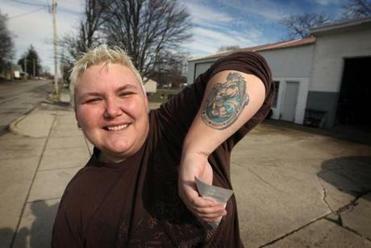 Angie Ragen, 35, a resident of Boston, Ind., showed off her Colts’ tattoo and is rooting for the Patriots to lose Sunday. “If I had to rely on people in Boston, I’d be out of business,’’ says Wayne, relaxing in a red recliner in the store’s empty showroom. He blames school consolidation for Boston’s woes, laments the “loss of community,’’ and has doubts about the town’s long-term viability, as more young people move out of town. But the news is not all bad: The Patriots are back in the Super Bowl and, with any luck, says Hoit, they will be destroyed by the Giants. A Colts fan who has watched the Patriots beat his team too many times, Hoit relishes the prospect of another Patriots loss in the final game of the season. But people in New England should not take his poison personally. Hoit says he was an avid Celtics fan when native son Larry Bird, known outside Indiana as “the hick from French Lick,’’ was winning championships in Boston. The sentiment was the same inside the cinderblock office at the town’s volunteer Fire Department. Chief Joe Buckler, who manages 18 firefighters and a fleet of four trucks, said he has never been to Boston and has no reason to dislike it. Boston or no Boston, on Super Bowl Sunday, Buckler says he will find it impossible to root for the Patriots.